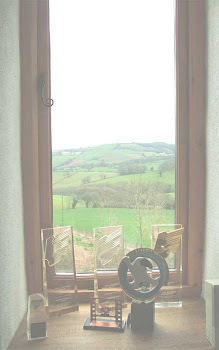 Animation and Drawing workshops in rural Mid Devon. 10% off if you have attended a workshop with us before. Her 2011 workshop was extremely popular and very successful. This day long workshop in drawing is suitable for all levels and is an opportunity to experiment, its a workshop day with a difference! The morning will focus on drawing from the life model. In the afternoon we will use a collection of flora and fauna from around the studio to draw a series of inspirational still life studies in rhythm with the seasons. Learning the fascinating drawing techniques inspired by the work of Cecil Collins and Frederick Frank. 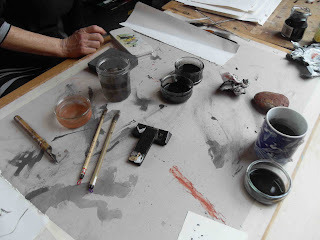 The day begins by grinding your own ink, using drawing tools from found materials such as feathers and wood, and learning about the raw pigments of Sumi ink and red chalk. It aims to be a friendly and studious day. To spark inspiration for other aspects of your creativity, such as painting, writing, photography perhaps even gardening! You will learn innovative techniques to develop your drawing skills. Limited places, book now. Louise Watkins studied Fine Art at Exeter School of Art – Plymouth University and Central St. Martins, London. After graduating she undertook an apprenticeship in traditional methods of painting and Iconography. She has painted in Glastonbury and Sherborn Abbeys and Exeter Cathedral and collaborated on commissions for York Minster. please contact sara@honeycombanimation.co.uk to register. Welcome to the Squeam Screen - Grizzly Tales at the Arts Picture House Cambridge. 10am Thursday 27th October.